Update: YU Yunique (YU4711) is now available without any registration on both Snapdeal as well as Amazon India along with some selected local store. On 8th September in the #FutureMeetsPast event YU unveiled it's ultra affordable smartphone YU Yunique which the company claimed to be the cheapest HD smartphone with 4G capabilities. The initial reactions to Yunique has been very positive from both the general audience as well as tech bloggers. 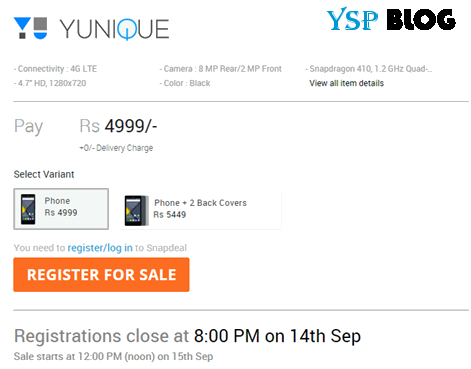 As has been the case with all YU smartphones Yunique will be available on a pre-registration basis flash sale. The sales model which is both popular as well as controversial. Also this time around YU has partnered with Snapdeal instead of Amazon India for delivery of it's fourth and the newest device. The change in shopping partner has brought about changes in the entire buying procedure. The flash sale on Snapdeal is quite different from Amazon India. This post is aimed at explaining each step in detail for potential customers of YU Yunique. You will see something like the above image. Click on register for sale. Kindly fill in your address on which you would like your Yunique to be delivered and click done. Please note that address you enter will be permanent and cannot be changed later on. If you do buy Yunique in the sale it will be delivered to this address only. So make sure to enter your genuine address. d) Your registration is complete now. You will get a confirmation like this and a notification email about your registrations. a) On the day of sale i.e. 15th September make sure you're logged into your Snapdeal account at least 10 minutes before the sale as a limited stocks will be available on the first sale. And you're done. Wait for the courier to deliver your Yunique. 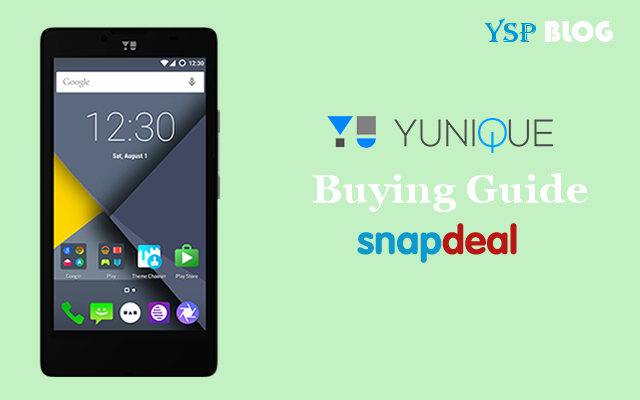 Hope this guide helps you in understanding the procedure of buying YU Yunique from Snapdeal. If you think we missed anything or you'd like any additional information feel free to comment below.